Mature protein without signal peptide consisting of HGF alpha and beta chain. Our Abpromise guarantee covers the use of ab632 in the following tested applications. The ED50, determined by the dose-dependent stimulation of the proliferation of monkey 4MBr-5 cells, was found to be in the range of 20.0 - 40.0 ng/ml. Expression System = Baculovirus infected High-5 cells. Centrifuge the vial prior to opening. Reconstitute in water to a concentration of 0.5 mg/ml. This solution can then be diluted into other aqueous buffers and stored at 4oC for 1 week or -20oC for future use. 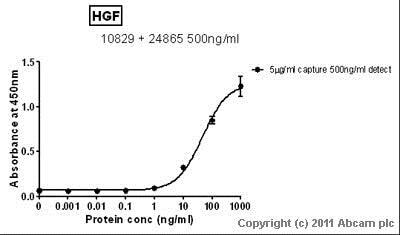 Standard curve for HGF (Analyte: ab632); dilution range 1pg/ml to 1µg/ml using Capture Antibody ab10829 at 5µg/ml and Detector Antibody ab24865 at 0.5µg/ml. ab632 has not yet been referenced specifically in any publications. 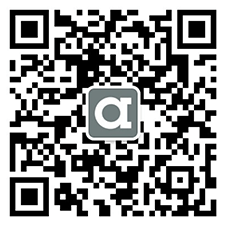 Is the protein HGF ab632 and ab4261 supplied as the active form?